Please find the available dates in the attached list. Each course starts on Sunday at 6:00 p.m. with dinner and ends on Friday after lunch. One course week from Sunday 6:00 p.m. to Friday after lunch costs 1.090,- Euro. Included is: please see the list. The price does not include your individual travel to the course location, any entrance or guide fees as well as food or drinks in addition to the full board. Your registration or any inquiry please send via the contact form. With the payment of EUR 765, - and acceptance of the Terms and Conditions your place is reserved and your room is booked. EUR 325, - for bed and full board you have to pay upon departure. 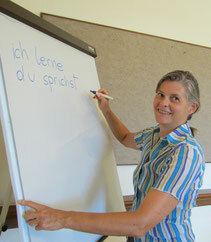 Learning German on holiday, with nice people in a relaxed environment.